NSIT PG 2019: The NSIT, Netaji Subhas Institute of Technology is among the top colleges for technical education. Situated in Delhi, the university offers curriculum for UG and PG courses. The UG Courses is offered as B.E course while PG courses are offered as M.Tech programs. The selection at UG level is granted through the JAC Counselling, while for getting admission in PG programs one has to appear in the NSIT Entrance Exam. The students who want to reach out more information of NSIT Admission 2019 M Tech to know details of exams such as exam dates, about the application form, exam pattern, syllabus, result and all other major events. Here is the list of all events which should not be missed by candidates willing to appear in the entrance exam that can provide the worthy platform. Check out NSIT Delhi Important Dates in the tabular form given here. The institute is among top 10 institutes in its category, thus NSIT PG Admission 2019 here is not simple. In order to appear for the entrance exam, one has to essentially fulfill the minimum qualification of the exam. The NSIT M Tech Eligibility will be as follows for all aspirers. Education Qualification: Qualified inappropriate specialization B.Tech./BE/B.Sc. Engg./AMIE as per the program applying for. However, the selection is done for the full-time course with scholarship, full-time course without the scholarship and Part Time M.Tech Courses. Hence the NSIT Admission Criteria is more elaborated for these courses. Here is the list of detailed requirement which shall be updated with the release of notification. The candidates who are interested in pursuing the M.Tech Degree programs which will commence in June firstly have to start it by filling the NSIT M.Tech Application Form. The aspirants willing to know dates can check out NSIT Application Form Last Date through the updates provided by us. From the website’s menu bar click on the option of Admissions. The registration page will land. Complete your registration first. Once done, proceed access the login page and open application form. Fill the required details and recheck it before submitting. Pay the fees through online medium and you have completed the submission process. Note: Candidates are required to submit a copy of NSIT PG Registration Form (submitted online) along with one Passport size photograph and one set of attested copies of certificates and mark sheets (please check the list of documents required on the website) on the date of Written Test/Interview. The admissions in each stream of M.Tech will be given on the basis of NSIT PG Merit List. The merit list will be prepared after the Application Form on the basis of analysis of the GATE Score, Interview, and tests conducted by the institute. The institute will set the preference as per norms decided for B.E/B.Tech. Here we will give updates about the merit list announcement so that applicants can know whether they have to appear in an interview or not. 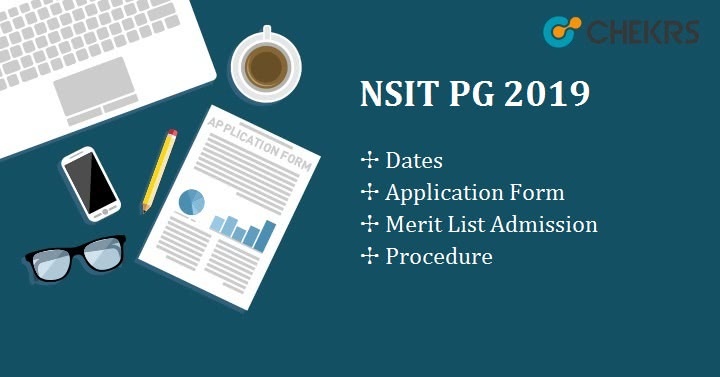 After the release of Merit List and NSIT PG Admission Cut-Off Candidates have to bring their original documents along with the self-attested photocopies at the time of admission procedure. After Successful Document verification Candidates will get admission in the preferred courses. Candidates are advised to visit the official Website Regularly to live updated about the Exam.